This story was originally published September 3, 1994. A year after St. Mary's Catholic Church was destroyed by fire, the building still lies in ruins. But its parishioners are standing taller than ever. Instead of severing the parish, the bolt of lightning that struck the 107- year-old building Sept. 2, 1993, has unified it. Five more families have joined the church since the fire, and parishioners have collectively come up with ways to continue carrying out the church's mission of service to their community. "Something like this either makes you stronger, or you fall apart," the Rev. Thomas O'Connor, St. Mary's pastor, said about the fire. "It has made us a stronger community." At five strategic planning meetings this summer, parishioners came up with a wish list of the spiritual and social functions it wants the new building to accommodate. The final meeting was Aug. 15, and now plans to build will begin. O'Connor said he wanted to make sure the parish's goals were clear before construction started. ''We're not going to move too fast," he told parishioners at the final planning meeting. "Patience is of the utmost. We lose our patience, then we lose our control." The first three meetings were mainly brainstorming sessions. About 75 people showed up at each, throwing out ideas about how St. Mary's should carry out its mission of service in the next 20 years. By the end of the third meeting, it was clear the community's needs had changed. ''It's not so much hunger anymore because we have resolved that with the soup kitchen," O'Connor said. The St. Mary's soup kitchen opened in 1975. After the fire, it was moved from the church's basement to the 90-year-old boiler house behind the church. It has gone from serving as many as 1,400 people a day before the fire to as many as 1,500 now, St. Mary's business manager Thelma Schulte said. ''Addressing problems of youth, drugs and violence in the inner-city neighborhood" was a new idea parishioners came up with. Another one was to foster "relationships with other inner-city parishes to combine the efforts to serve our inner-city constituency." At the last meeting, the final wish list was completed. "These are our dreams," said rebuilding committee chairwoman Barb Jones, who moderated the meeting. "Maybe we won't find them until we get to heaven, but this is what we dream." *The house of worship should have room for 500-600 parishioners, a baptismal area, cry room and a choir. It also should be accessible to people with disabilities, have a lot of light, and an open, welcome feeling. Finally, the new church should keep some of the physical and historical characteristics of the original building. *For parish activities, parishioners would like to have a separate building with room for gatherings and religious education, a library and sleeping quarters. *For neighborhood and community activities, the new structure should include multipurpose rooms and space for youth activities. Also mentioned was the need for indoor eating and drive-up capability for the soup kitchen, more administrators, overnight room for the homeless and space for the Wear Haus, where donated items such as clothing and household goods are distributed to the poor. Now that the parish has decided what it wants the new church to be like, O'Connor said he will meet with officials from the Fort Wayne-South Bend Diocese, then take bids from architects. The architect will use the list to help design the new building with $6.9 million the church has collected from its insurance settlement and donations. Then, parish members will come together to approve the plans before construction begins, O'Connor said. Parishioners are eager to have back their own building. Since the fire, they've held Mass at St. Paul's Catholic Church, 416 W. Washington Blvd., at 9:30 a.m. Sundays. ''It'll be nice to go back to our old parish and not have to share," parishioner Ginney Purcell said. O'Connor said St. Mary's needs to return to its original home to continue to serve the needs of its own neighborhood. ''You're talking two different people with two different personalities," he said about St. Paul's and St. Mary's. "St. Paul's has West Central and its work with the Hispanic community, while St. Mary's has East Central." Ken Yahne, a parishioner for 23 years and amateur church historian, agreed. "We have a presence in our neighborhood that we need to maintain," he said. Structural experts also are anxious to see a new building. The longer the ruined building stands, they said, the greater chance the walls could fall in. Dave Snyder, a structural engineer who was hired by the diocese to examine the church, said the walls should be braced soon or they may not make it through another winter. Another structural engineer, Harold Hill of Wiss, Janney, Eistner, Associates Inc., of Northbrook, Ill., who examined the church for the insurance company, said the walls should have been braced at the end of May. ''The longer they're exposed," he said, "the more of a chance they'll be hit by a big wind and fall." A tentative schedule handed out at the final strategic planning meeting said an architect would be awarded a contract by November. Non-parishioners will be as happy to see a new St. Mary's as parishioners. The publicity surrounding the fire has made the community more aware of the church's spiritual and social importance in Fort Wayne. Ann Marie Scholl never attended St. Mary's but started working in its soup kitchen just last month. Through her work, she has met new friends and gained an appreciation of the church's role in the community. "St. Mary's has brought a lot of people together," she said. It's that community of people that has kept alive St. Mary's since last year's fire, said Steve Sullivan, who has been a parishioner on and off for 25 years. He compares the mutual need St. Mary's and its community have for each other to a pitcher of water. ''You pour water out of a pitcher but have to continue to put water back into it to keep it full," he said. "In the same way, the community keeps filling St. Mary's as we pour ourselves out for others." 1848: The city's first German-language Catholic church, called St. Mary's Mother of God Church, is built after 30 German families raised $1,700 to purchase the southeast corner of East Jefferson Boulevard and Lafayette Street. 1858: Mother of God Church is converted to a school, and a new church, called St. Mary's Church, is built for $30,000. New, larger church is dedicated on Nov. 2, 1839. Jan. 13, 1886: Fire breaks out when the steam boiler below the church explodes at 1:30 p.m. Boiler tender, Anton Evans, and 13-year-old passer-by Alberta Willard were crushed to death by the massive front door that was blown off the building and into the street. Later, a small building is built next to the church to house the new boiler; church planners chose this to avoid a similar tragedy in the future. Dec. 11, 1887: The present Gothic Revival church, of red brick and sandstone, is dedicated. It was built for $75,000. The center tower was 238 feet, flanked by two 128-foot spires. 1892: St. Mary's Girls Academy opens. 1903: The St. Mary's School is built across street from the church. It has a gym, bowling alleys, library and reading rooms. The rectory also was built. 1963: Both the Academy and the school close. Jan. 22, 1975: St. Mary's Soup Kitchen opens. May 1976: Matthew 25 Health Clinic opens. Dental Clinic opens in 1979. 1980s-1993: Extensive repairs are made to the church roof, windows and walls. The repairs were ongoing, funded with $500,000 donated. Sept. 3: Mass is held in the rectory. Catholic Charities volunteers operate Soup Kitchen from a donated semi-truck. Sept. 12: Services moved to St. Paul's Catholic Church, 416 Washington Blvd. November 1993: St. Mary's Wear Haus reopens at 425 E. Washington Blvd. Wiss, Janney, Eistner, Associates Inc., a Chicago engineering firm, said St. Mary's walls could stand through spring. January 1994: soup kitchen moves to old boiler room. March 29: Bishop John D'Arcy announces a $6.6 million insurance settlement reached with Catholic Mutual. Donations for the soup kitchen and rebuilding totaled $290,560. D'Arcy also says a smaller St. Mary's Church with a larger, more modern area for the soup kitchen will be constructed. May to mid-August: Strategic Planning meetings are held to involve parishioners. Services have been moved to St. Paul's Catholic Church on Washington Boulevard while the congregation ponders its, and its building's, future. The flames that engulfed St. Mary's Catholic Church last year left the 107-year-old building a skeleton and the community in shock. But parishioners have kept St. Mary's alive and have drafted a 20-year vision for the church, which will be incorporated into the new building. A bolt of lightning struck the church roof and was seen by a jogger moments before the fire was discovered. Neal Davis, St. Mary's maintenance man, smelled smoke and went to check the furnace. When he returned to the choir loft it was ablaze. At 2:21 p.m. the fire was reported. The first firefighters confronted a thick, gray smoke on the front of the church. The sacristy, where holy vessels are kept and where the priest dresses for Mass. The fire stopped at the door to the sacristy. Items saved: Priest's vestments and stoles, chalices and dishes for Holy Communion, and funeral palls. On the outside the firefighters couldn't break through the stained glass windows because of the Lexan panes, so they waited until the panes melted. The panes, similar to Plexiglas, were installed to protect the windows from vandalism. 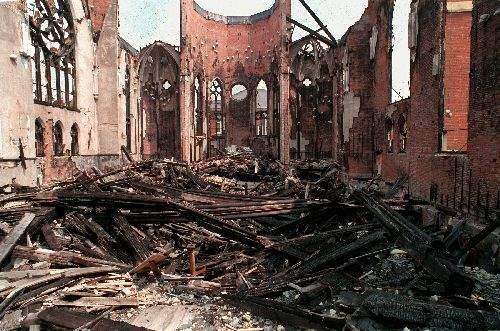 Flames spread quickly through the wooden skeleton of the church, and the roof collapsed. At 3:50 p.m. the flames devoured the tallest of the building's three spires on the west end. About 50 firefighters and 10 pieces of equipment fought the fire. At 5:43 p.m. the fire was brought under control.